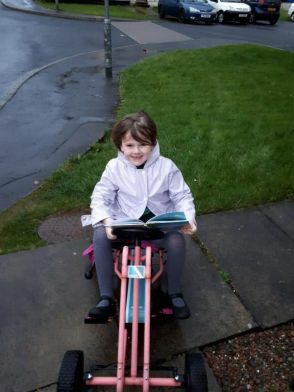 We are a child-centred, all inclusive, integrated school that revolves around the achievement of each child’s potential- academically, socially, physically and emotionally. With a positive attitude and a sense of fun, we will create an enriched learning environment that is a safe and happy place for each child to achieve success. Our staff is dedicated, caring and professional. We are looking forward to working with the whole school community to help Oakgrove’s pupils become active learners who are imaginative, inquisitive, innovative and creative. The Oakgrove website is an amazing online resource whereby the school can share information about the school day, celebrate achievements and highlight upcoming events. On the website you can explore the different sections regarding our school prospectus, curriculum information, policies, class pages, current news, and parent and community links. We hope you find our website enjoyable, accessible and useful. Big Bedtime Read Event in nursery. Am class. 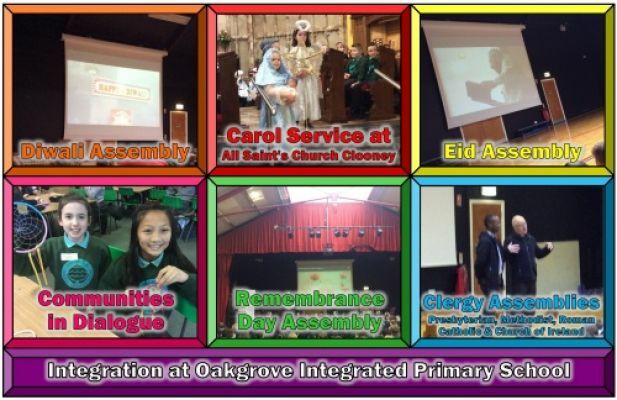 Above is just a snapshot of some of the wonderful things that happen at Oakgrove. At Oakgrove we are keen to challenge our children and staff and the rest of our school community. We have an ethos, within the school where we embrace difference and celebrate diversity. Exposure to as a wide a variety of experiences and challenges is what helps children, staff, families and ultimately our communities to grow. As an integrated school, a school which teaches children of all creeds, race, gender and ability, we want to lead the way for education in Northern Ireland. Only 7% of the population are educated in integrated schools in Northern Ireland. As an integrated school we want to challenge this, on a local and global level. There are times in our school life that integration all comes together and gives us a reason to celebrate being an Integrated Primary School. During this year we have celebrated and remembered with a number of different faiths and cultures. We have held a Remembrance Day Assembly, celebrate Diwali, the Hindu Festival of Lights, Eid al-Adha, also known as the Greater Eid, which is the second most important festival in the Muslim calendar, Chinese New Year and St Patrick's Day. We held our Harvest Service in Ebrington Presbyterian Church and our Carol Service in All Saint's Church, Clooney. We celebrated our Service of Light and Enrolment, for the Roman Catholic children who are making their Sacraments this year, in St Columb's Church, Chapel Road, our Confirmation, in St Oliver Plunkett's Church, Strathfoyle and our Sacrament of Reconciliation in St Columb's Church. 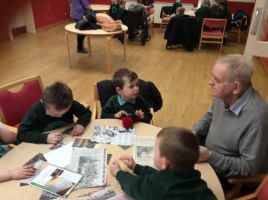 We also proudly hosted the Communities in Dialogue Event, which welcomed community representatives, politicians, school representatives from both secondary and primary schools, Parents' Group members, our school pupils, as well as community leaders. Every Thursday, we welcome members of the local clergy who lead us in our assemblies. We welcome Rev. P. Linkens from Ebrington Presbyterian Church, Fr. S. O'Donnell from the Waterside Parish (Roman Catholic), Rev. D. McBeth from All Saint's Church Clooney (Church of Ireland) and Rev. P. Murray from Clooney Methodist. Teacher (Temporary post/September 2019 – June 2020) beginning 1 September 2019. Further details of the post and an application pack may be downloaded below or on request from the school secretary on receipt of a SAE with a large envelope and 1st class stamp or in person at the school. Application forms must be completed in black ink and returned to the Chairman of the Board of Governors. The closing date for applications is 12:00 noon on Thursday 9th May 2019. Please find below the documents for the post. Please find the school calendar & Winter school dinner menu below. Calendar dates for 2019/2020 are subject to change and parents will be notified in advance of any changes. 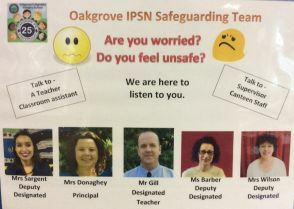 If you are interested and available to provide temporary cover for staff absences and sick leave, please send your CV to info@oips.lderry.ni.sch.uk. Please note that temporary support staff supply cover means that personnel may be contacted at short notice to provide cover for staff absences, these may often be short periods of time ranging from a few days up to a few weeks. Click here to see some of the Big Small Stores of Integrated Education. 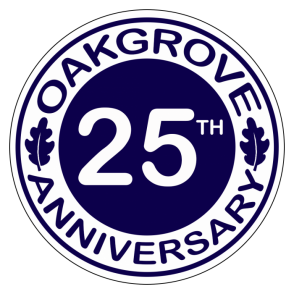 Click on the badge to find out more about 25 years at Oakgrove.